ODM hold National governing council meeting – Kenyatta University TV (KUTV). All Rights Reserved. The Orange Democratic Movement (ODM) party today has held a National Governing Council (NGC) meeting at Bomas of Kenya. Speaking during the event, the party leader and Coalition for Reforms and Democracy (CORD) principal Raila Odinga said that the party should not afford to lose the next elections. “The nominations mistakes of 2013 must not be repeated. 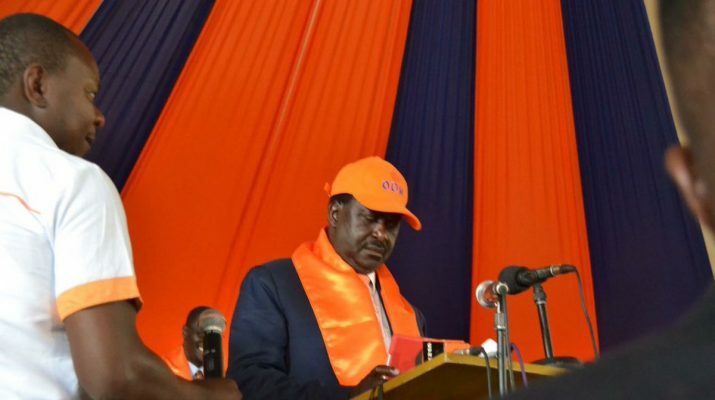 Only the loyal lieutenants must get the nominations,” Raila said. The ODM leader did not to hesitate to say something on the ongoing health scandal, Ksh 5b. ” We revealed the NYS scandals and they said we were lying. Now we have revealed the Health ministry scandal,” said Raila Odinga. The CORD leader further warned leaders against taking Kenya back in the years of dictatorship saying 2017 elections will be the decision maker on what direction Kenya is headed. “Status quo forces want to take us back. 2017 poll will determine whether we move forward or back to dictatorship,” he added. Hon. Richard Onyonka who had decamped to Jubilee made a shocking about turn, and return to the ODM party apologizing to Kenyans over his move to ‘betray’ the party. “I take this opportunity to apologize to party leader Raila Odinga and to all ODM members,” said Richard Onyonka.